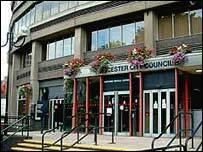 Labour has wrested control of Leicester City Council away from the ruling alliance after the Tories deserted their former Lib Dem partners. Labour leader Ross Willmott will take over from Lib Dem Roger Blackmore after the alliance was defeated in a vote over the city's regeneration plans. The alliance took over the leadership after the May 2003 elections following years of Labour control. Mr Willmott said the leadership change came as "a surprise". "After the vote in the chamber last night, I believe the members are saying the Labour group has more credibility and the right policies to govern the city," Mr Willmott said. The Labour group will meet in the next few days to map out the future direction of the city. The alliance also faced criticism from local voluntary groups in 2003 when their funding was cut by the council. The voluntary groups launched an appeal and some of the cash was restored. Former leader Roger Blackmore said: "In my view, we had a strong stable plan for the city and had done a great deal of good and put the city's finances in order. "I think we now have a minority government that doesn't reflect the will of the people."